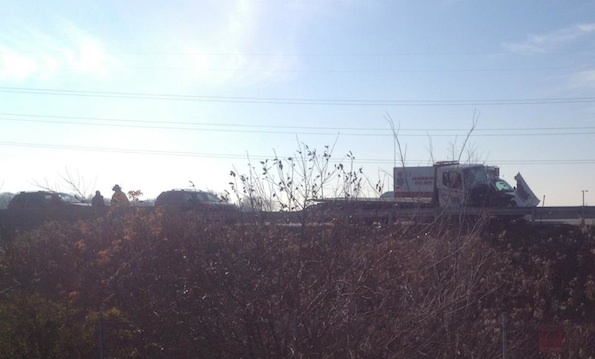 Crash on I-90 just west of Golf Road (more photos …). 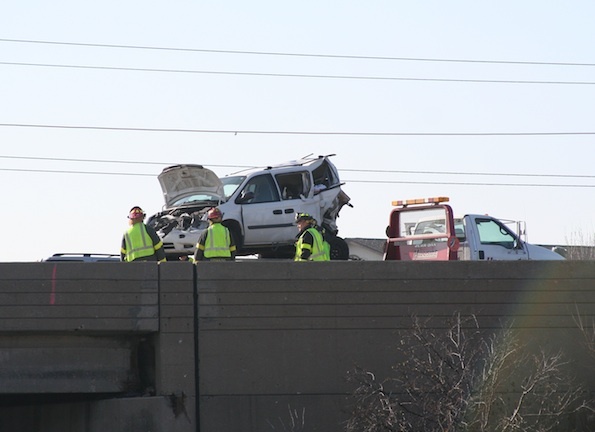 Arlington Heights firefighter/paramedics and Illinois State Police responded about 10:46 AM Saturday to a report of a multi-vehicle crash on westbound Interstate 90 east of Route 53. Firefighter/paramedics received a report that four vehicles crashed with two rollovers.Firefighter/paramedics first on the scene reported no entrapment, and two victims injured with non-life-threatening injuries. No confirmation if additional injuries were discovered after initial assessment. A flatbed tow was involved and was crashed into the outer guardrail which prevented it from rolling down the embankment into an industrial of Rolling Meadows. Ambulance just arrives at crash on I-90 Saturday just before noon (PHOTO CREDIT: Commercial Specialties Inc. http://www.commercial-specialties.com/).